When designing the perfect bathroom, there’s one element that often trips up homeowners and renovators. You may very well instal the most superb bath tub and the most elegant sink, and have gleaming chrome fittings throughout, but then you step back and the room looks bare. This is because, just as when you design an outfit, you must not overlook accessories! Because bathroom accessories get changed quite often, they’re very easy to miss when you’re looking at the bigger picture for your design. Alternatively, some decorators try too hard to match their new room design to a particular cherished accessory. Whether you’re redecorating or just looking to make a small, cheap change that spices up your existing décor, why not start with a blank canvas. Building your accessory collection from the ground up can be a great way to breathe new life into the room, or ensure that your redecoration is consistent. 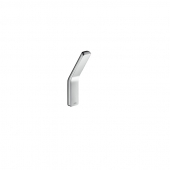 These items are affordable and easy to find when you shop around online. More often than not, websites have discount items that are not available in a store. 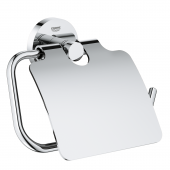 Think of accessories as finishing touches that accentuate the design of your bathroom and help other elements stand out. For example, matching the colours of the items below to the colours of your tiles can really round off the room’s theme. These are a few items that tend to get forgotten but can make all the difference. 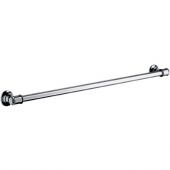 Towel rail. Hidden behind the towels, these are easily missed, but stick out badly when they don’t match the contours of other fittings. Soap rack. Along with soap dishes, these are often swapped for liquid soaps, but they have a timeless style that can boost your design. Toilet brush. Not the first thing you rush out to buy, a modern, quality brush makes the whole room feel cleaner. Shower basket. Sitting in the corner of the shower, the basket doesn’t have to be merely functional; an attractive chrome basket will complement shower fittings. 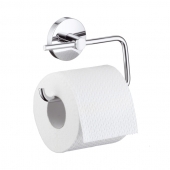 Toilet roll holder. You can do better than a boring metal hook! These items and others add to the character of your room, topping off your design choices, and making the daily use of the room more enjoyable. Spending a little time to fit them into your design plan and budget will pay off in the long run. When you’re redecorating the whole room, don’t get too focused on the bath, toilet or sink units. Save a little of that budget for the items that finish the design and get a lot of daily use. They don’t have to be expensive if you look for the brands that offer affordable accessories, nor do they have to be plain and basic. Even if you’re simply looking to spruce up the room, you can benefit by checking out some of the more design-focused manufacturers out there. These are just five producers of excellent accessories that can complete your room design: Grohe, Keuco, Hansgrohe, Emco and Dornbracht. 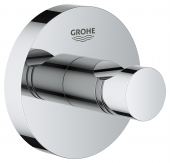 Grohe are a household name for contemporary fittings. 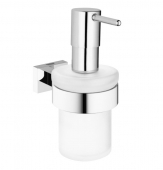 For example, Grohe have the Allure range, which includes a chrome brush set and liquid soap dispenser. Both of these add a smart elegance to an otherwise humdrum, everyday element. 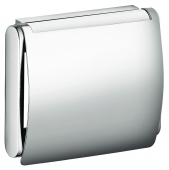 Keuco are another well-established brand producing very modern alternatives to typical accessories, like a cube-shaped toilet roll holder and matching items that stand out with deco style. 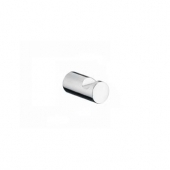 Keuco are known for the Keuco Plan range, which features affordable chrome items and a touch of gadgetry, like a hairdryer and cylindrical roll dispenser. The Plan Care variant caters to people who need assistance, with folding seats and hand rails to help with bath time. 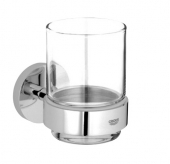 For simple, unadulterated style try Hansgrohe. The Hansgrohe Logis range covers every item in the room, and incorporates some glass elements that should complement a light, airy room. 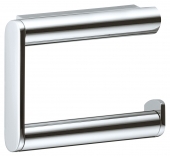 Emco have a towel rack in the System 2 range, which showcases towels on four sturdy rails. 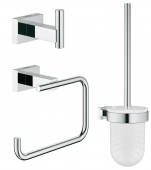 Lastly, the Tara range by Dornbracht has some sleek black items, such as towel rings, if you want something different. Consider these options when shopping for bathroom accessories and you won’t be disappointed. This is a room in constant use, which deserves a little tender loving care.